I had another seizure Sunday night. It was similar to the one I had in May, and Jenna and I agreed that I should get on the next flight back to the US to see doctors in Seattle to manage my care long-term. I did so and landed at SeaTac Tuesday afternoon. Unfortunately, my 90 day visa to French Polynesia has expired, and I have no legal no way to get back to Bora Bora until I am issued an emergency visa. Jenna was able to get a 3 week extension for her and the kids due to my medical emergency, but I am in diplomatic limbo as we try to get the attention of the visa department of the French Consulate in San Francisco. We spent Thursday and Friday working with the visa department of the French Consulate in Los Angeles, and they were vey cool, but ultimately determined the consulate in San Francisco has jurisdiction for US citizens in Seattle, so I need to work directly with them now. My name is Jenna Miller and we are US citizens from Mercer Island, Washington. I am currently in Bora Bora with our two young children who are 5 and 8 aboard our sailboat, “Sophie.” My husband, James Utzschneider, who was here in Bora Bora with us, experienced a medical emergency this week and we are now in urgent need of a new visa for him so he can rejoin us and we can continue our family voyage together. 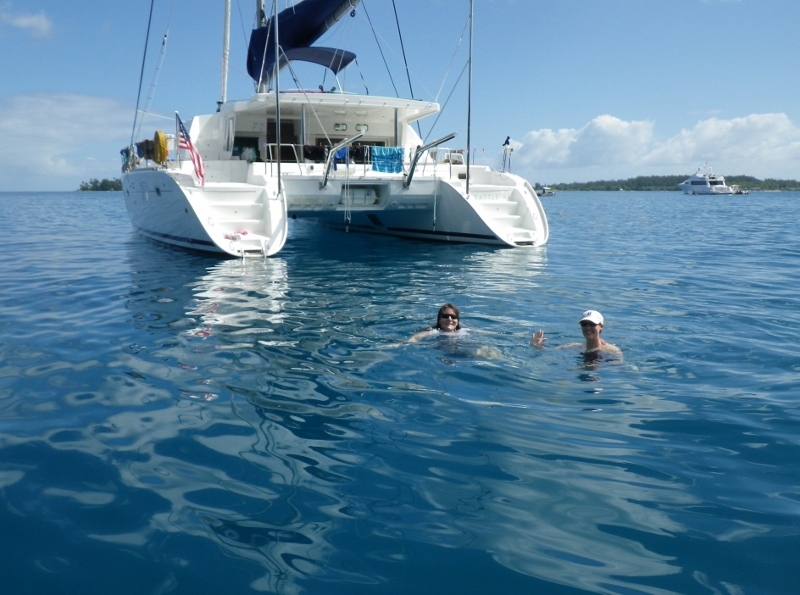 We departed the USA from San Diego in March and crossed the pacific on our sailboat to French Polynesia where we have been cruising for the last 3 months as part of the “Pacific Puddle Jump” boats travelling across the south pacific this season. 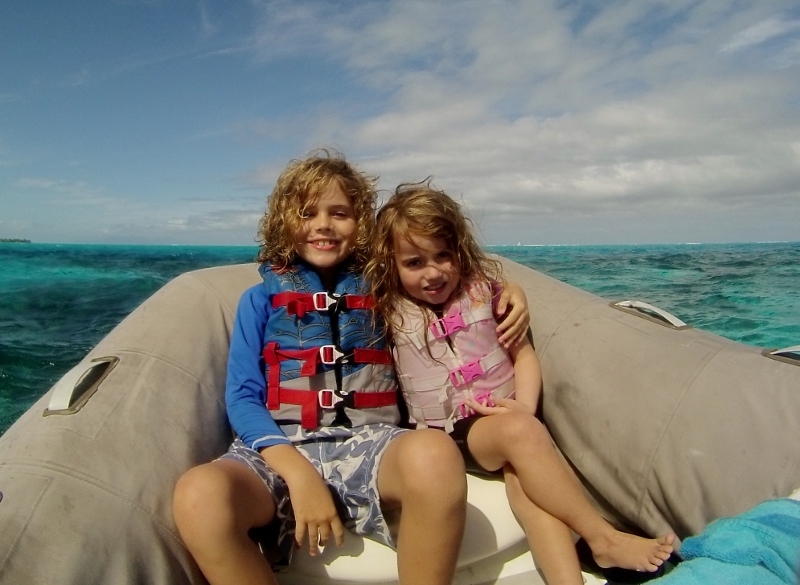 We had planned to leave French Polynesia from Bora Bora this week to continue to sail to the Cook Islands, but in the middle of Sunday night James had a seizure, which required him to fly to the USA so he could be treated by epilepsy specialists. About a month ago he had the first seizure of his life while we were travelling in French Polynesia and was hospitalized in Papeete, Tahiti for several days under the care of Dr. Larre, a neurologist there. After many tests, they concluded he was unlikely to have another seizure, so we continued our trip. We consulted with Dr. Larre again by phone Monday morning after James’ second seizure and agreed that it would be best for James to see additional specialists in the USA immediately. Therefore, on Monday morning we consulted with immigration agents in Papeete who told us it would be fine for James to return to the US and then come back to Bora Bora, given this was a medical emergency, but that it would be necessary for myself and the children to apply for special extensions to our visas in order to remain in French Polynesia while he was away visiting doctors this week. We did this and were granted a 3 week extension to await James’ return. We arranged doctor appointments and put James on the first available flight to the USA. He is now in Seattle completing his medical appointments. However, today I received a phone call informing me that the approval for James were told we had on Monday, for him to return here, was wrong and that he would not be allowed to come back after all because his visa had now expired since he left French Polynesia. We have spent all day making new requests to customs and immigration officials in Papeete for an exception to be made, since this was due to a medical emergency and we were originally told that this would be ok. We are confused that we were granted an extension for myself and the two children due to my husband’s medical emergency, but he, the patient, is being denied re-entry. We only need a visa for 2 days so he can fly to Papeete, then to Bora Bora and we can check out with the gendarmes here and depart for the Cook Islands, but customs officials in Papeete said they have no authority to grant him a new visa since he returned to the USA. They referred us to you, the French Consulate in Los Angeles, for help. We have no intention of remaining in French Polynesia and only want to be reunited so we can safely continue our offshore voyage. As the mother of two small children I am concerned about the prospects of undertaking a multi-day offshore open ocean crossing without my husband here. I’m sure you agree these circumstances are extraordinary and we realize we are at the mercy of your assistance to help reunite our family. If there is anything you can do to expedite our request and resolve this problem we most appreciate it. Eloquent and riveting as usual. All I want is permission to enter French Polynesia so I may be reunited with my family and leave on my sailboat for the Cook Islands. We’ve thought about the idea of having Jenna take the boat directly to the Cook Islands and I could meet her there, but when I first looked at the weather forecast for Aitutake this week it looked like she’d be facing winds up to 30 knots in 4 meter seas with an 8 second period. The forecast has subsequently gotten a little better, but based on these conditions the kids will be holding bowls on their laps for 3 days during the 500 mile passage. Meanwhile, in Seattle I went to see Dr. Alan Wilensky at the University of Washington Regional Epilepsy Center. By having a second seizure Sunday night, by most definitions of the word, it means I have epilepsy, even if I never have another seizure. But as I learn more about it, I realize its not that big of a deal. Remember, I used to have cancer. Dr. Wilensky is a nice 70 year old semiretired doctor who has been treating epilepsy for 40 years. We spent 90 minutes talking in his office at Harborview Medical Center, and then he reviewed my test results from the French Hospital in Tahiti and gave me a physical exam. For starters, he doesn’t think my first seizure was caused by a tumor, stroke, alcohol, tattoo, fish poisoning, sleep deprivation or Hazel. He said based on my blood work there is a remote chance it was triggered by my body fighting off something, but we will never know for sure. Seizures are apparently common in children and in people over 50 (I’m 51), so it is not completely unusual that I would have one. Apparently 8% of the population has at least one seizure before they die. He thinks that there is a good chance that my second seizure was caused by a rapid withdrawal from the benzodiazepine that the physicians prescribed for me for the month after my first seizure. US physicians do not typically use this drug to treat epilepsy for a variety of reasons. However, Epilepsy apparently is a condition that can be contained by drugs on an ongoing basis to prevent seizures so patients can maintain a high quality of life. He’s going to put me on something called Keppra, which apparently works for most patients without negative side effects. We have a good friend who has been on this medicine for two years without incident. In terms of our cruise, he wants me to avoid baths, swimming by myself and SCUBA diving. Based on my two seizures, he thinks I am most at risk during the 10 minutes when I when I wake up from a deep REM sleep, and he discussed this with Jenna when she was on the phone with us for fifteen minutes (dialing in from the Bora Bora Yacht Club). He also put me back on the benzo for 3 weeks as I ramp up my dosage of Keppra. He is a strong believer in gradual drug transitions. Our situation could be worse right now. I mean, Jenna is “stuck” in Bora Bora with our good friends the Reibelings, and it has only rained for half of my days in Seattle since Tuesday. I also get to reconnect with friends here. And based on a recommendation from a friend of mine in the State Department, I plan to be at the San Francisco French Consulate when they open on Monday. And … if anyone has suggestions or connections that can help me expedite my reunion with my family, please send them my way. I miss them terribly and want to ensure “The Ballad of Jamie and Jenna” has a happy ending. Sorry we haven’t gotten a blog post in for a couple of weeks, but Sophie is now in Bora Bora, the site of Jenna’s and my honeymoon exactly 10 years ago, and we’ve been busy. Last night we attended the opening of a month-long cultural festival/dance competition involving groups representing villages from across Bora Bora. The highlight for me was most definitely the group from Faanui, above, which featured over eighty dancers backed by a chorus of fifty singers and drummers. They claimed their performance was an original interpretive work titled “Land: Proof of My Existence” (I wish Max was still here to help me parse that one), but I knew the dance was really just one big collective booty shake in celebration of my nephew Danny’s birthday, which is today, and is celebrated throughout the world with similar dances. The Island put a great deal of work into preparing the venue for the cultural celebration/birthday party, and the results are impressive. The main performance area is a quad of packed sand 50 meters a side with a viewing stand on one end and a decorative tiki platform on the other, all surrounded by a village of palm huts used as game rooms, changing rooms, band rooms, and facilities for the 250 people who help administer the event (we assume this is subsidized by the French government). Off to the side is another collection of huts that have been turned into a street of 15 restaurants and bars that we’ve been told stay open until 3:00 AM. 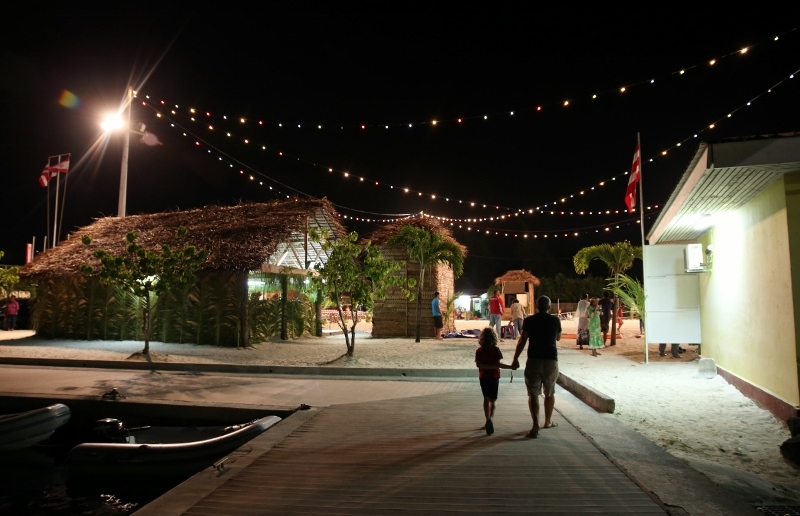 The whole area is lit up with Christmas lights and is filled with smiling families and tourists from the hotels, a cruise ship, and les bateaux. It was all built in the last week, and we plan to come here every day we remain in Bora Bora. It’s that cool. Earlier this week we went swimming out by the reef and anchored next to a tour boat that was feeding the sharks and rays. We were anchored in 3-4 feet of water, and one could simply stand there and watch the sharks and sting rays happily swim right up to you and say hello. Jenna was in heaven shooting a lot of photos and video. Hazel absolutely refused to get out of the dinghy. She is still recovering from having a moray eel lick her leg a week ago. Leo swam right up to the sharks but got his fill within a few minutes. Me? I was mostly looking out to the other (ocean) side of the reef for signs of birds indicating the presence of tuna and Mahi Mahi. While anchored off the motu Topua here, the Mahina Tiare III motored by and said hello. This sailboat is a well-known Hallberg Rassy 46 sloop and is owned by John Neal and Amanda Swan-Neal, who operate a cruising school that takes students on offshore legs throughout the world. 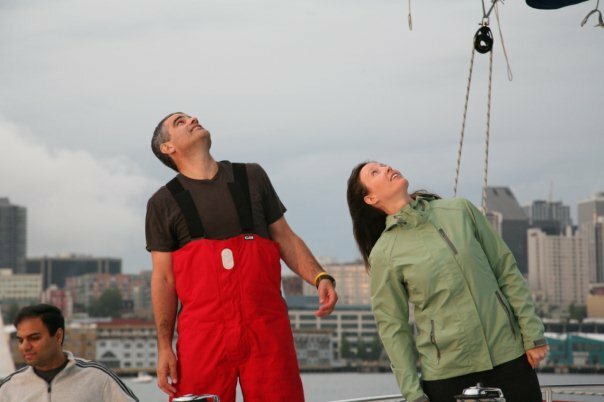 John is originally from Seattle, and he and Amanda spend a couple of months a year in the Pacific Northwest and speak frequently on the west coast boat show circuit. I first toured the Mahina Tiare III at a Seattle boat show in 1999, and I liked the boat so much I bought a similar model and named it Sarita after my daughter Sara. They currently have 6 students and are on a 3 weeks trip from Papeete to the Cook Islands. We invited all of them over to Sophie for a glass of wine and a tour of the boat, which they all seemed to enjoy a great deal. This meant a lot to me and Jenna, because John and Amanda have been a big inspiration to us over the years. 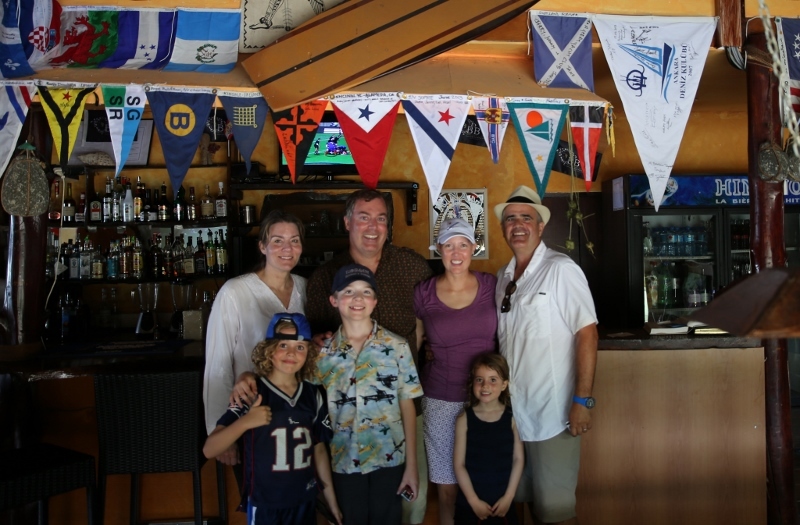 The visit was a lot of fun, and they countered by graciously asking us to join their crew the following evening for dinner at Bloody Mary’s, the famous Polynesian bar and restaurant on the south side of the island. The restaurant has its own dock, mooring balls, and 33 year history. Jenna and I ate there twice during our honeymoon 10 years ago and were eager to return. The restaurant hasn’t changed during that time: sand floors, topical décor, and a menu laid out on an ice table as you walk in. It was a great dinner with a fun crowd. Our fish was excellent. Bloody Mary’s is right up the street from the Hotel Bora Bora, the place where Jenna and I stayed during our first visit to the island. Sadly that hotel has changed a great deal since our honeymoon. It’s basically destroyed, the victim of business disputes, cyclones, and overbuilding. 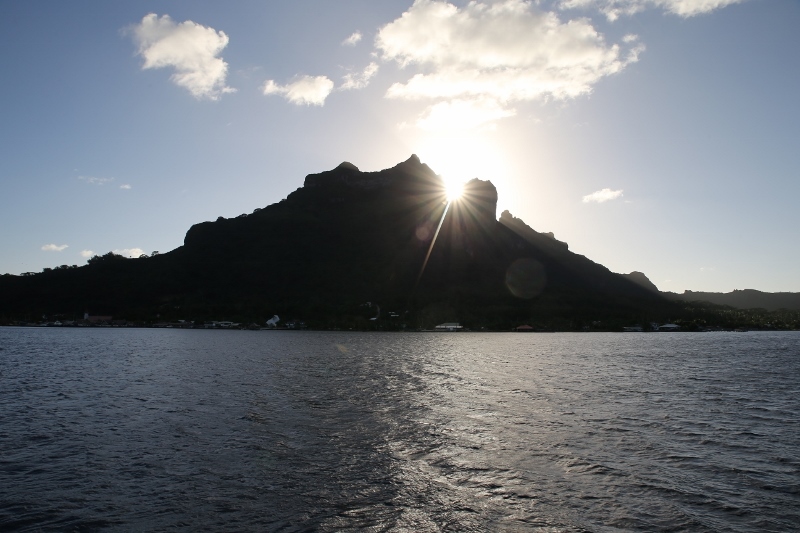 We heard that tourism in French Polynesia right now is at the same level it was in 1981. There are several waterfront hotel complexes on Bora Bora that are similarly abandoned, and the rest either have caretakers or operate at half-capacity. Apparently the hotels in the Cook Islands and Fiji are doing quite well, but that is not the case here. It’s too bad tourism hasn’t fully resumed, regardless of the reason, given how beautiful it is here. I’ve gone fishing twice in the last week, both times trolling in the dinghy outside the reef. The first time was with Leo, and we used a GPS to track our location as we headed 5 miles out. After a couple of hours we finally found the flock of birds, and there were even 2 local commercial boats trolling right where we were. Unfortunately, the wind picked up when we got there, and Leo and I decided to head back in. Safety first, especially in the dinghy! For the second time I went out by myself and after 90 minutes spotted hundreds of birds feeding on a fast moving school of bait. I raced around for an hour chasing them with my lines in. I didn’t catch anything but have to say it was one of my best fishing experiences ever. It was amazing. This morning our friends the Riebelings arrived for a 3 week stay. We are so excited! They’ll be joining us as we head from Bora Bora to the Cooks. This marks the beginning of a 6 month stint where we have friends from Seattle visiting us every month. That’s Tanya and Jenna and Sophie, all in the water together, hanging out. It’s what we frequently do. 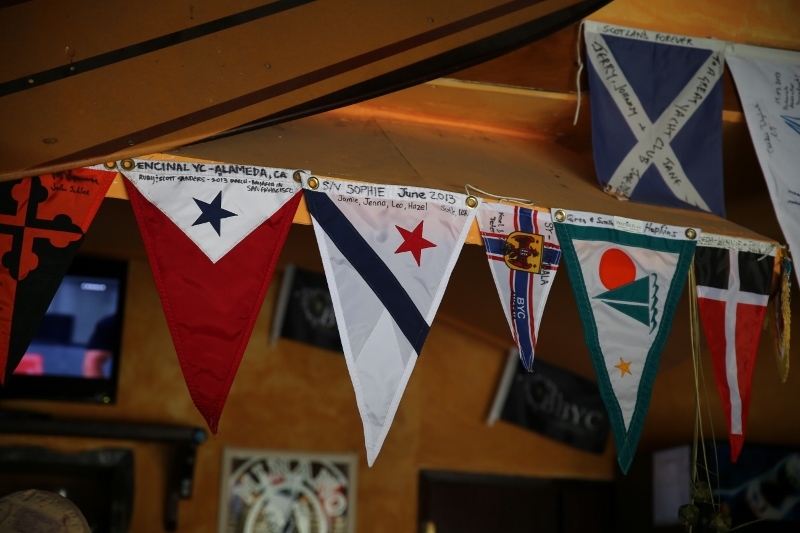 We kicked off the Riebeling visit with lunch at the Bora Bora Yacht Club where we presented the staff with a Seattle Yacht club burgee, which they promptly hung directly over the center of their bar. Anyone from Seattle who visits this part of the world definitely needs to check it out. 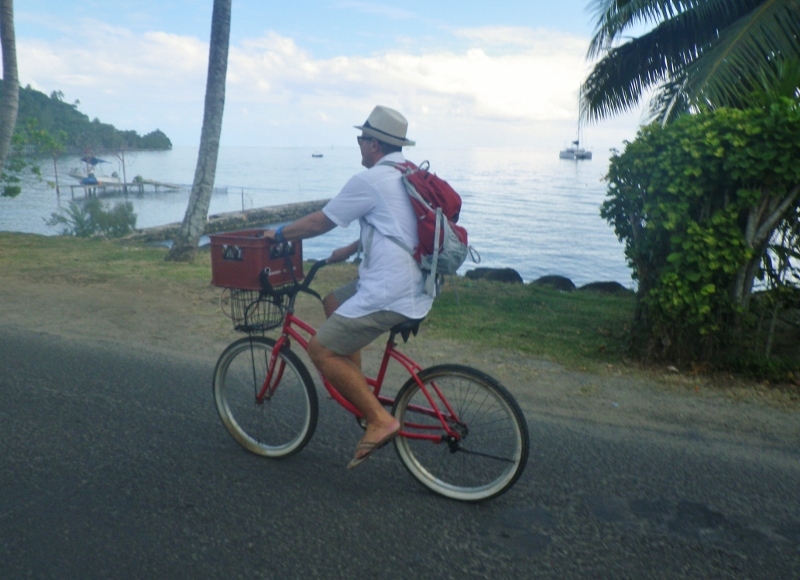 Finally, I flew back to Papeete this week for a follow-up visit with the doctors. Everything looks good from their end. The trip continues. Like I’ve said before on these pages, we’re blessed. There will be plenty to write about as we continue on our journey, so stay tuned. We’ll keep rolling along. As some of you know, yesterday was my birthday. I got to choose how we would spend the day, and I chose to go fishing. So we got up at 6:30 AM and motored over to the gas station, which is what all the fishermen here do before they head out. Unfortunately they weren’t selling duty free fuel (which we are eligible to buy), so we skipped the diesel. But I did buy some donuts, baguettes, new sunglasses (I’ve gone through three pairs since March), and the bad boy pictured above. That baby is fifteen inches long with 2 inch wide hooks and will be towed behind Sophie from now until the end of time. By the way, one potential problem with leaving at 6:30 AM to go fishing is that if you and your wife stayed up until 2:00 AM that same morning watching the complete fifth season of the TV series “Friday Night Lights”, you can be a little tired. But that didn’t stop us. After the Shell Station we motored out of Teavapiti Pass on Raiatea to go fishing. It was a sunny day with a 15 knot easterly and a small 1-2 meter swell with a long period (15 seconds) coming from the south. The shorter the period, the steeper the waves and the greater the discomfort if you were heading into them. 15 seconds means not much discomfort. Our plan was to cover a triangular course: head east about 10 miles away from Raiatea towards Huahine (which is 20 miles away), then turn west-northwest towards Toahotu Pass and Tahaa, the island immediately north of Raiatea that shares a reef with it. When we came over from Huahine last week, we caught a tuna in this middle ground between the two atolls and assumed that was where we would catch the big one using the bad boy pictured above. As part of last week’s catch, we saw over a 100 birds hanging out at this spot, feeding heavily on small surface fish. The theory and practice around here is that if there are birds feeding on the top, there are predator fish (tunas, mahi mahi, marlin, etc.) feeding from below. So the whole idea is to look for birds feeding, troll through and around them, and then catch fish. When Max and Becca were with us, we passed a couple of these bird feeding towers. When we got our subsequent double takedown/whale siting a week later, it was through one of these spots. So yesterday, that was what we were looking for. What did we see? Nothing. The occasional bird flying low over the water doing the same thing we were doing, looking for fish. We saw nowhere near as many flying fish as normal. There weren’t even many fishing boats out. But it was a beautiful, sunny day, and we weren’t complaining. For the last week we’ve had a series of fronts come through and the weather has been pretty bad with consistent 20-30 knot winds along with 3-5 meter swells with a relatively short period along with frequent rain. 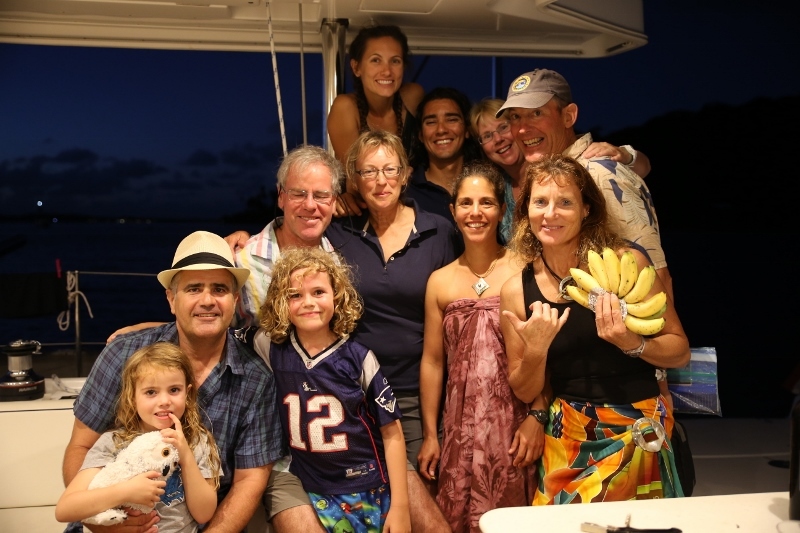 We’ve been quite happy to have been holed up inside the reef of Raiatea during this time. So we went out to our 10 mile spot and saw no birds but did see two local fishing boats who were fishing for tuna at depth. 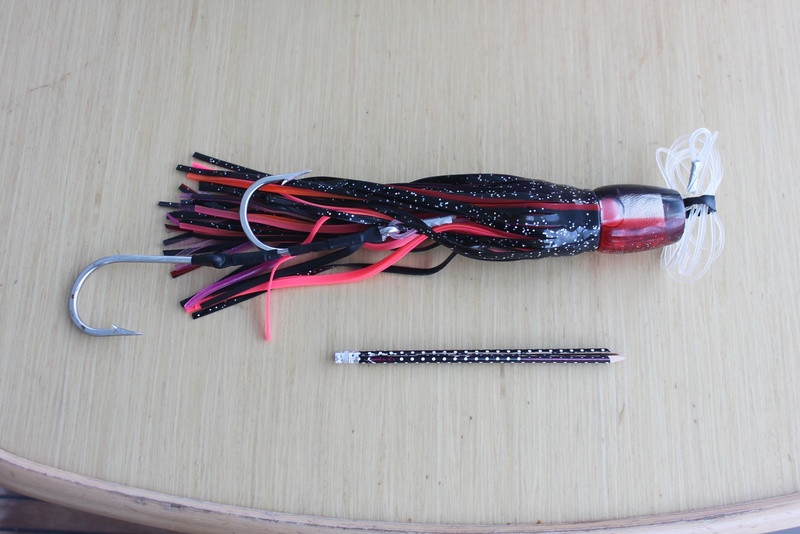 This involves using baited hooks similar in size to the ones on bad boy above, except instead of trolling they were attached to 20 pound rocks which in turn were attached to plastic floats the size of a soccer ball which in turn were attached to their boat. The idea is that the fish hits the bait, becomes exhausted hauling the rock/float combo and is then pulled into the boat by hand. We had seen a guy in Manihi catch a 40 pound Yellowfin right outside the southern pass using this technique. But that wasn’t our plan, so we circled these guys, waved hello, and made our turn towards Tahaa. With that turn, our ride became much more comfortable since we were now heading with the wind and the swell. It wasn’t bad before the turn, meaning we weren’t getting spray up to the flybridge, there really weren’t many whitecaps, and the kids down below watching movies weren’t getting sick. But after the turn it felt like we were out for a cruise on Lake Washington. By the way, have I mentioned lately that Jenna seems to be doing all of the boat driving and navigation these days? Well, she is and she loves it and has become quite good at it. I love it too because it frees me up to do boat projects and more importantly, to fish. And it makes me occasionally realize that I actually had the luck to marry a girl who likes to drive boats. So after she made the turn and we headed back to Tahaa’s eastern pass, I kind of whined, said it was my birthday and asked if we could go around Tahaa and enter the lagoon from its western pass, Papai. This would add at least 2 more hours to our trolling even though it was near noon and we were exhausted from our TV marathon the night before. But it was a beautiful day and our trip would force us to look at Bora Bora. It’s only 10 miles away and was the site of our honeymoon 10 years ago along with being our next destination after Tahaa. So of course she said yes and went downstairs to make pizza baguette paninis for the kids while letting them know that their movie marathon, pretty much their longest since San Diego, would continue through the afternoon. No complaints there. So we trolled along Tahaa’s northern and western coast, saw the occasional hungry bird and startled flying fish, and nothing else. After entering Papai pass, Jenna drove the boat inside the lagoon around Tahaa’s southern points and we then picked up a mooring in Haamene Bay in front of the Hotel Hibiscus. There was still some daylight, so Jenna did her 75 pushups (we’re both still following the book) while the kids and I played Rat-A-Tat-Cat. We then played a birthday game of Scrabble. Leo won, mainly by getting a bingo on a triple word score on his first turn. We then dinghied in to the hotel’s restaurant, which is appropriately names Chez Leo. 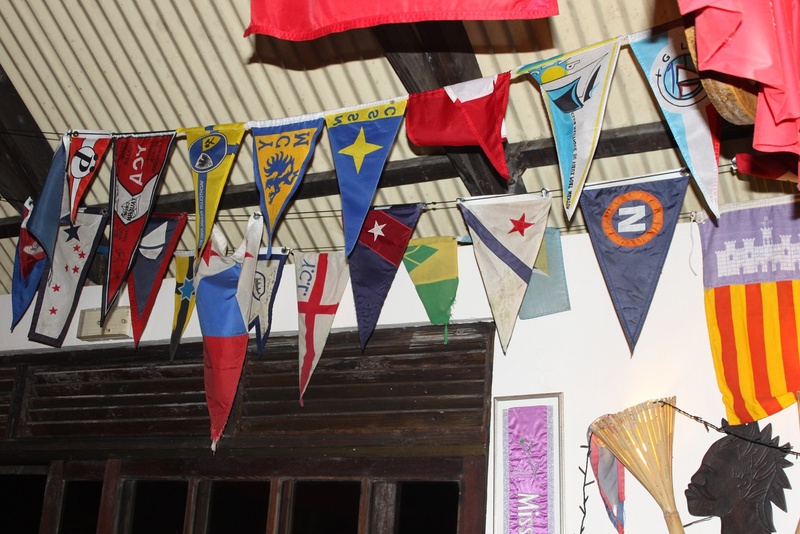 It’s what we thought all of the beach restaurants in Polynesia would actually look like: big open room that reeks of history with hundreds of flags and burgees hanging from the ceiling. We all had the quiche, Jenna and I had the carpaccio, Jenna and Leo had the crab, I had the marlin steak, and Hazel had the kiwi steak. 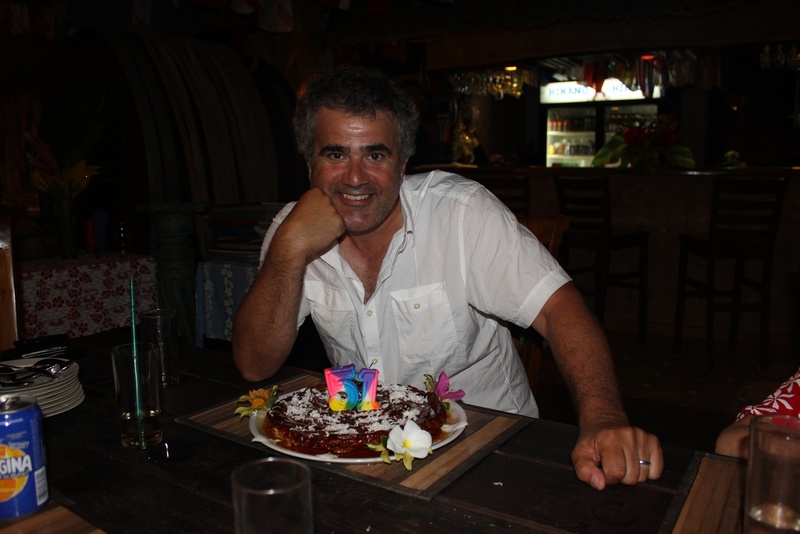 They even brought out a caramelized tarte tatin with coconut for my birthday cake. It was a wonderful meal that capped off a wonderful day. I am quite grateful with how my life is going right now.